Co. Galway: Annahdown, Arran (2), Athenry, Ballynacoortia (2), Clare Galway (2), Galway City (15), Killanin (3), Lackagh (2), Moycollen (3), Oranmore (2), Oughterard (3), Stradbally. The Board also included 10 ex-officio Guardians, making a total of 47. The Board met each week at noon on Wednesday. The population falling within the union at the 1831 census had been 97,581 ranging from Stradbally (population 1063) to Galway itself (33,120). The new workhouse, built in 1839-41, was built on an 8-acre site at the west side of the Newcastle Road in Galway. Designed by the Poor Law Commissioners' architect George Wilkinson, the building was based on one of his standard plans to accommodate 1,000 inmates. Its construction cost £8,162 plus £1,637 for fixtures and fittings etc. It was declared fit for the admission of paupers on 27th Dec 1841 and admitted its first inmates on 2nd March 1842. The site location and layout are shown on the 1921 OS map below. An entrance and administrative block at the east of the site contained a porter's room and waiting room at the centre with the Guardians' board room on the first floor above. On the 1921 map, it had been extended at the north end, possibly to add an additional children's wing. The main accommodation block had the Master's quarters at the centre, with male and female wings to each side. At the rear, a range of single-storey utility rooms such as bakehouse and washhouse connected through to the infirmary and idiots' wards via a central spine containing the chapel and dining-hall. After the formation of the Irish Free State in 1921, the destitute in the Galway workhouse were transferred to the County Home in Loughrea. A hospital was established at the workhouse site, known as the Central Hospital. In 1956, a new Regional Hospital was built on an adjacent site and the old Central Hospital was demolished in 1957. Galway also had a general hospital on Prospect Hill at the north side of the town. This too has now been demolished and the site is occupied by county council administrative buildings. However, a small infants' graveyard survives on the site. 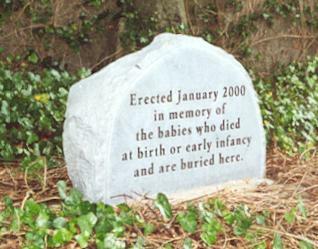 Galway hospital infants' graveyard, 2000. Galway local archives, Island House, Cathedral Square, Galway. Holdings include Board of Guardians' minutes (1839-1921).